The excitement mounts as race participants line the river to see thousands of adopted rubber duckies released into the waterway, floating downstream to the finish line on the Big Thompson River near Rockwell Street. Each duck is a potential winner to its adopted owner, with hundreds of prizes available to those with the fastest duckies to finish the 2 ½ mile race. And we’re not talking about toys, plastic trophies or inexpensive stuffed animals being awarded as prizes. 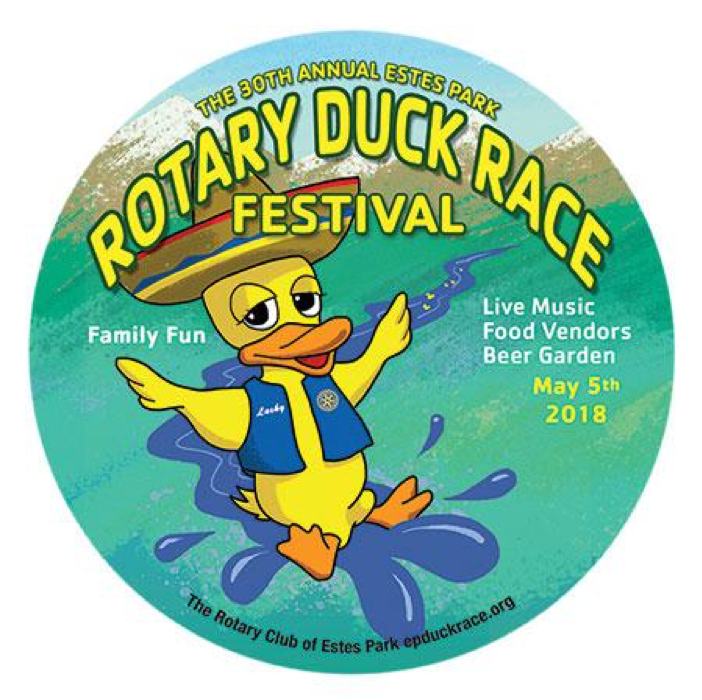 In addition to major support from sponsors of the race, the duck race committee has rounded up some serious gifts, ranging from vacation packages to tropical locales such as Costa Rica and the Mexican Riviera, to creative and costly prizes donated by Estes Park merchants. Of course, you can’t win any of these fabulous prizes if you don’t adopt a duck. The price for participation is only $20 for each duck you adopt. The cost is $22 for an online adoption. But here’s where the real deal lies: For each duck you adopt, $19 goes directly to our Graduate Higher Education Fund benefiting college scholarships for Eagle Rock School graduates. NOTE: To ensure Eagle Rock is credited with your purchase, in the Other Information section of the checkout form, be sure to select Eagle Rock School in the mandatory Select Charity dropdown menu. Our Grad Fund is unique in that it directly and immediately supports the needs of our high school graduates with a $14,000 scholarship for higher education. We’re setting a goal of $10,000 for this year’s effort to support the future through our graduates. Last year alone, our scholarship fund benefitted from more than $9,000 as a direct result of the Estes Park Rotary Duck Race. 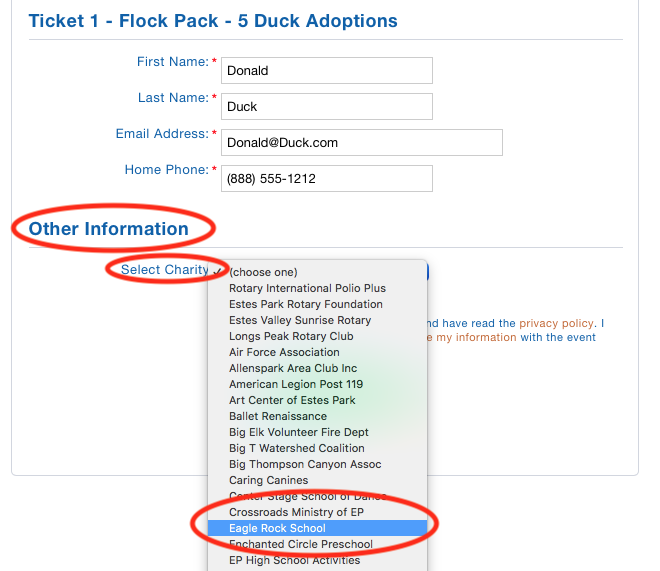 So now that you know a little about our cause and the amount of funding we’re able to raise when lots of our stakeholders participate, why would you stop at adopting only one duck when you can grab up two, or three, or an entire pack of 10 ducks? The Grand Prize is a choice of two trips — or $6,000 in cash. Eight nights in Costa Rica, or seven nights on Mexico’s Mayan Riviera. Your pick. Second prize is a choice of a five-day Seattle/Vancouver Rail Trip; three nights in San Diego with airfare; or $3,000 cash. Again, you select the destination. Third prize is choice of two trips (or $2,000 cash) to a historic hotel in Albuquerque for three nights or three nights at a first-class hotel on the Las Vegas strip. Both trips include airfare. Other major prizes include vacation trips with vouchers for airfare to Yellowstone National Park; Yosemite National Park; the Pine Lodge in Whitefish, Montana near Glacier National Park; and the Kennedy Space Center in Cape Canaveral, Fla. Duck adoptees also have the opportunity to win literally hundreds of merchant prizes donated by local business owners in Estes Park. And you don’t have to be present for the race to win. Just check back later (on the Duck Race website) to see if you’re a winner. The race committee will also be notifying winners by email. In addition to adopting a duck(s) to support our higher education fund, we’d appreciate it if you could also share this blog post on your Facebook page. And while you’re on the computer or mobile device, email a link to this blog post to friends who aren’t into Facebook. And be sure to click on this link and adopt as many ducks as you can comfortably afford to help our graduates take the next important step after graduation. This entry was posted in Graduate Higher Education Fund and tagged Duck Race, Estes Park.